Blood Winter, the fourth book in the Horngate Witches series by Diana Pharaoh Francis, takes an interesting turn by introducing a cult-like leader named Benjamin Sterling into the mix. All around Max and her friends, the world is falling apart. They feel it is their duty to protect the remaining humans and save other witches from being persecuted by Sterling. A mysterious dust with a mind of its own has its sights set on Horngate, and Max is willing to bet that it’s somehow connected to Benjamin Sterling. 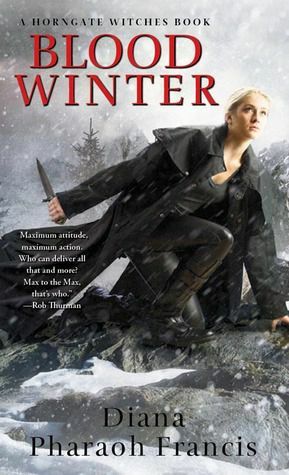 Blood Winter is the last book I will be reading by Diana Pharaoh Francis. I felt it had the most potential of this particular series, but failed to reach reach it. As I was reading, I began to re-imagine the scenes in my head, seeing exactly where I would change things to make this an overall better story. This series is supposed to be set in a sort of post-apocalyptic world, but it has always felt very contained to Horngate and its immediate surroundings. I would have liked very much for Francis to broaden the scope and shone the impact the Guardians and demons are having all over the world, and not just in Missoula. In my mind, I am picturing only a small group of cities in epic ruin, while the rest of the world is calmly and unknowingly going about their business. As with some of the previous books in the series, I had some concerns about the editing of the book. Once again, I felt there was far too much “telling” rather than “showing”; Francis doesn’t really allow for the reader to interpret things on his or her own–we are told exactly how things are. There were a few typos as well, but by now I have come to expect that in almost any book I read. In this case, though, there were a few more grammatical and punctuation errors than I normally encounter. The Horngate Witches series definitely has a fan base, but I’m simply not a part of it. Max was a bit too rough around the edges, Alexander was kind of whiny, and there were too many secondary characters to keep up with. I even read these in pretty quick succession–which I almost never do with series–just so everything would stay fresh in my mind, but I was still drawing a blank as to who some of the characters were and what role they’d played in earlier books. Looks interesting. Thanks for the review. Never heard of this author. Hmmm…not sure this one would be for me. Thanks for the review! I was pretty interested to see what you had to say about this book because i read the review on the last one.. I do love to read and the cover looked interesting on the last, but don’t plan on purchasing this series to read. I think the most important part is feeling for the characters..
How refreshing. A totally honest review! I always wonder if everyone really loves everything they try. I most definitely dislike more books than I like books. I use Goodreads to keep track of what I’ve read and want to read, and if you were to look at most of what I’ve read this year so far, all of the ratings except for one or two are three stars or less. I save 5-star ratings for books I really love–and unfortunately there just aren’t many of those. I also don’t ever feel guilty of writing a negative or critical review; things I dislike in a book may be things that others love in a book, so I like to think I’m helping people either way. This book sounds interesting. I would like to read it to see if I would like it. It sounds like your review portrayed the book as it is. I am going to see about reading this book because I like these type of series! Amazing book and excellent review. Thanks for the honest review. It does get annoying when authors fall into the tell trap; one has to wonder if they lack confidence in their own ability to get across the point or in their readers’ intelligence. Although I usually like supernatural books this sounds like soemone didn’t take enough time to complete the characters or edit it. Thanks for the review. I adore your honesty. I’m still slightly intrigued of this series. Thank you for your honest review…. I think I will give this one a pass. Too many books, too little time! I really appreciate your honest review. I hadn’t read this author but the cover looked intriguing. It will definitely be toward the bottom of my list – probably knocked off altogether – after reading your thoughts. It’s too bad the story wasn’t followed through better. The idea sounds interesting. Im tired of books that promote the occult, thanks for the review. After loving Anne Rice other witch series have not thrilled me but after your review I will ive this one a try! I love these types of books…I will have to check it out on my Kindle. Thanks for the review and piquing my interest. I too sometimes wonder why most reviews are good ones 🙂 But then I thought maybe they just don’t review if they don’t care for it! Not..your site in particular, just in general. Anyways…I am okay with a few typos, but poor editing in general really takes away from the enjoyment of a book for me, I am too OCD about that. Thanks for the honest review! Not my type of reading material. I’m also sick of books about witchcraft and the occult. Seems like everything is about witches, vampires, werewolves, etc nowadays… But thank you for the review. These books are so overdone. Yes there seems to be a lot of people interested in the vampire – para normal books now a days. I too personally dont like to read them tho some of themsound okay on the lighter side of it. Thanks for the review. I have a friend who is into them so I will let her know.